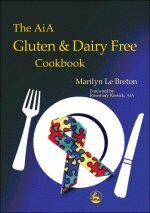 Contains over 400 gluten and dairy free recipes for those whose diet is restricted due to food intolerances. Some people on the autism spectrum are turning to the gluten and casein free diet and are finding that many of the more troublesome symptoms are significantly alleviated. Coeliacs, and those with lactose and other intolerances may also find useful ideas for cooking without gluten or dairy products.